Happy holidays to everyone! I hope you all had a fabulous time with friends and family. We certainly did and came home with more than we could’ve expected. My kitchen is becoming better stocked at each passing holiday, and I didn’t even have to get married! 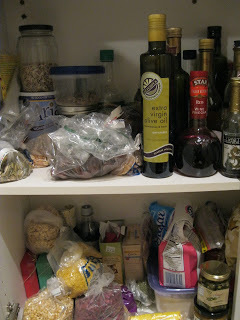 If your pantry is like mine, it is filled with open packages (i.e. stale) crackers, bags of dried fruit and cans of everything under the sun. It’s time for a kitchen purge. I suggest, you start at one end of the kitchen and move to the other. If your partner is a “lleeeettttt’s not throw that away” type of person, you may want to send them out to walk the dog. It’s time to organize the things you use and rid yourself of the items you don’t. I just did this and found out a few things: I have 4 cans of fish (why?! ), 3 separate bags of dried Turkish apricots (mild obsession) and an opened box of baking soda (that goes to the fridge). 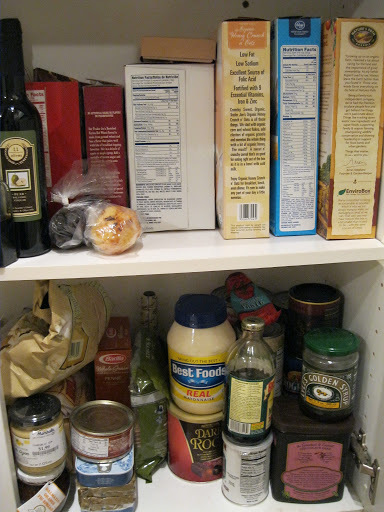 1) Don’t keep things in the pantry that you never eat. Example, I was given a box of dehydrated fondu. I am never going to use this. It was time to move on and get rid of it. 2) Organize as you go, baking items to one side, savory sauces/pastas/beans to the other. If you have spices in odd jars, use slices of paper to help label. 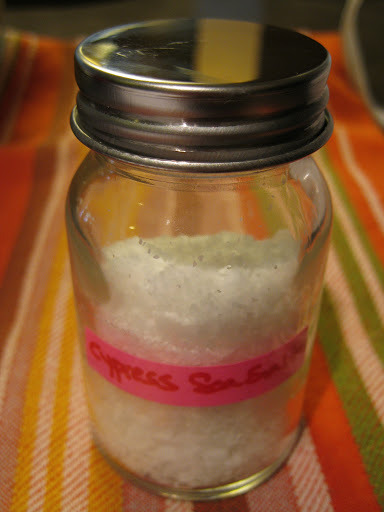 Write the name on the paper, cut a small piece of it out, use packing tape as adhesive and tape to the jar. 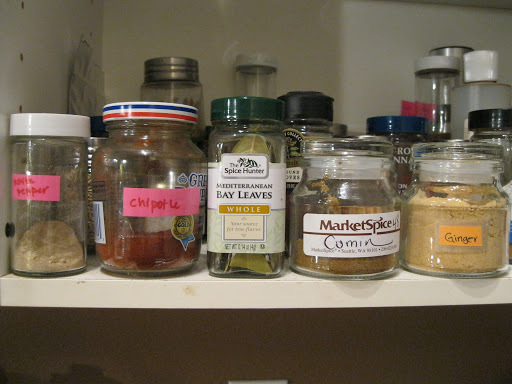 It’s quick and informative and you don’t need a million dollar spice rack to keep things in order. 3) Use the last odds and end of dried beans and grains now. Throw them into the Crock-Pot with a bay leaf, stock, chopped carrot, celery, onion, a few pinches of herbs and let it go. You’ll have a healthy meal for next week when work kicks back into gear and you have no time to cook. 4) Make a note of things you have but forget are in the pantry. Make a list for you and your partner so you’re literally on the same page. This always happens to Eddie and I. He will independently grocery shop and buy all the things he uses but doesn’t know I already bought: mayonnaise, dijon, cereal… you get it. So make a little list of “Things We Have” and post it on the fridge. This also might help for cooking inspiration. 5) Have some fun! Turn on good tunes and enjoy the cathartic process of letting things go that no longer serve you. Good for you! Have fun and a fabulous new year!c. ← Introducing My Services Though Zaarly!